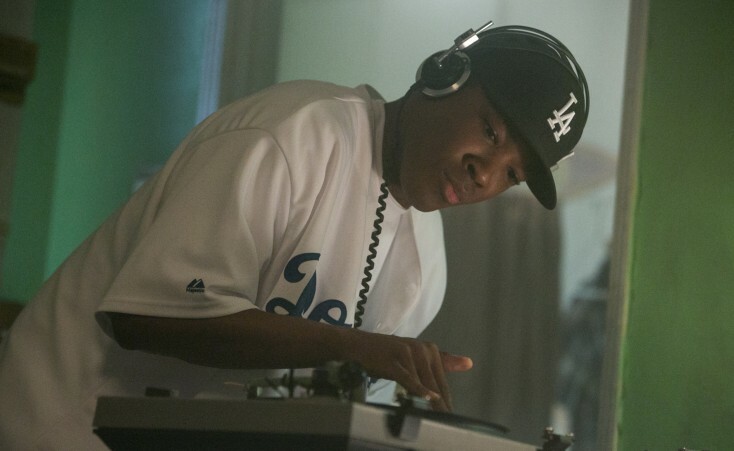 (L to R) Eazy-E (JASON MITCHELL) raps while Ice Cube (O’SHEA JACKSON, JR.), Dr. Dre (COREY HAWKINS) and DJ Yella (NEIL BROWN, JR.) listen in STRAIGHT OUTTA COMPTON. ©Universal Studios. Hawkins initially had his own doubts. The tall, suave performer knew he didn’t look or sound like the streetwise deejay, but he decided to go ahead and make an audition tape for director F. Gary Gray. That taped performance turned out to be dynamic enough for the filmmaker to take him seriously for the role. Not only did Hawkins win over Gray, whose credits include “Friday,” “The Negotiator,” “Be Cool,” and “Set it Off,” he also impressed Dre (born Andre Romelle Young) himself. During the lengthy casting process, Gray encouraged Hawkins to sit down and talk to the noted music genius and one-fifth of the pioneering rap group, who also is a producer on the film. Though anxious about meeting the man he had long admired, Hawkins said their introduction went well. By the end of dinner at a tony L.A. restaurant, Dre pulled out his smartphone and played the audition Hawkins had submitted, nodding approvingly. Then, it was time to get to work on actually playing Dre on film. Throughout production, Dre made time for Hawkins, serving as a both a mentor and valuable resource. He assured the young man that he didn’t expect an imitation, but rather a representation of N.W.A., and what the group stood for. “If you put that first, then everything else will follow,” he told Hawkins. Surviving members of the popular and controversial rap group would occasionally come to set and Dre was no exception. He showed up with some of his family members on the day Hawkins was shooting a scene involving Dre’s brother’s death. The scene called for Hawkins to break down emotionally, both enraged and saddened by the news. Hawkins initially misinterpreted Dre’s departure, thinking the rap mogul left because he didn’t like what he saw. It wasn’t until later that he discovered the actual reason for Dre’s exit. Raised by his mother, a police officer, Hawkins grew up with a healthy respect for the law. His biological father was sometimes in and out of trouble, he reveals, so he was acquainted with both sides of the coin. Prior to production, Hawkins bonded with his co-stars, including Jackson, who is the lookalike son of Ice Cube, the character he plays onscreen. He said that while the cast had fun together, they also approached their job seriously. Particularly important for them was getting the look of the group recording in the studio and performing on stage before thousands of extras just right. Hawkins and Brown learned to work the mixing board and turntable from Robert “DJ Robshot” Johnson. Ice Cube brought in fellow rapper William “WC” Calhoun from Westside Connection, another Ice Cube music collaboration, to coach Hawkins and the other cast with their rap styles and stage presence. WC made time for each of the actors, showing them the process by breaking down the lyrics of each song on their platinum-selling album, Straight Outta Compton, as well as each member’s signature style, cadence, tonality and delivery. Similarly, Ice Cube and Dre were on hand throughout production, encouraging and advising the actors as they shot pivotal events in N.W.A.’s history, including making their now classic album. “To have Cube and Dre right there in our ears telling us we’re doing a good job and that Eazy (who died in 1995 from complications of AIDS) would be proud (was) just a powerful feeling,” he says. Hawkins says he owes a lot to director Gray, who was both demanding and helpful in getting the best performance out of his actors.